Smaller Mattebox - D/Mattebox or Cavision Mattebox ? I am interested in purchasing a smaller type of mattbox for the GH2 as well as a Nikon D600. Does anybody have any experience with following matte boxes. I like the idea of being able to clip the matte box onto a lens, I am leaning towards the D/Mattebox because of all the extras that it comes with. Please chime in with your opinion or suggestions for other similar setups. There's a whole thread about this. Search for it and you'll find out all you'll want most likely. Thanks @vicharris I performed a search and found information about the Cavision mattebox but there is very little information on the D/Mattebox. I bought the D|Matte before the Cavision and returned it. It was pretty flimsy and couldn't fit my 4mm-thick filters. @QuickHitRecord Thank you for sharing your thoughts about the D/Mattebox. I think I will pass on the D/Mattebox and purchase the Cavision. FYI, The Shoot35 cinebox always looked good to me. It's a little more money but from the specs and the company's track record of R&D possibly a better option. They recently changed their name from shoot35 to budgetcameragear. That can only help the pricing, http://www.budgetcameragear.com/CINEbox-4x4-Matte-Box-s/1820.htm There is a current promotion of 10% off at checkout. Thing is it is topic about small MBs. The D/ Matte Box takes 4x4 filters and has flags as does the Cinebox I linked to. 4x4 is the smallest square filter commonly used (found available to rent -if needed). 3x3 and smaller were found on the Arriflex 16mm S and BL, as well as on the 35mm IIc and to my knowledge is not really a widely used format. The Cavision uses it, but, in my experience few others do. Some rental places may have some 3x3's leftover from the 1970's when the Arri 16 BL was in regular use. Thanks for for the link and pointing out the fact that the 3X3 filters are not as commonly available as 4X4 filters. I personally prefer to purchase all of my own gear and do not like to rent anything unless I really have to, but I appreciate the heads up just in case I do need to rent. I already have a 82mm Tiffen VND filter and also a 72mm Genustech VND filter with screw on hoods for a super light setup. In regard to the smaller type of matte boxes I think the Cavision is hard to beat. The matte box itself only weighs 360g and for the most part I think I would be able to use just that without the flags. 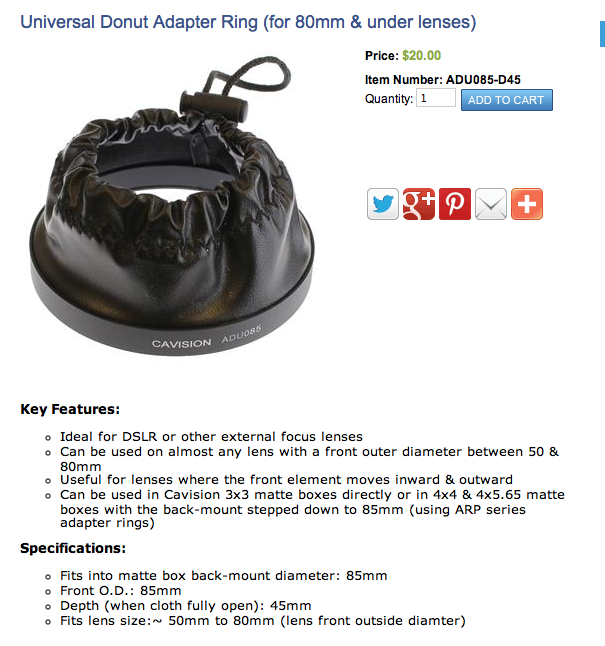 But if you look at the larger picture, Cavision has all sorts of accessories that are available for this matte box. This makes the Cavision Mattebox way more appealing then some of the other choices. 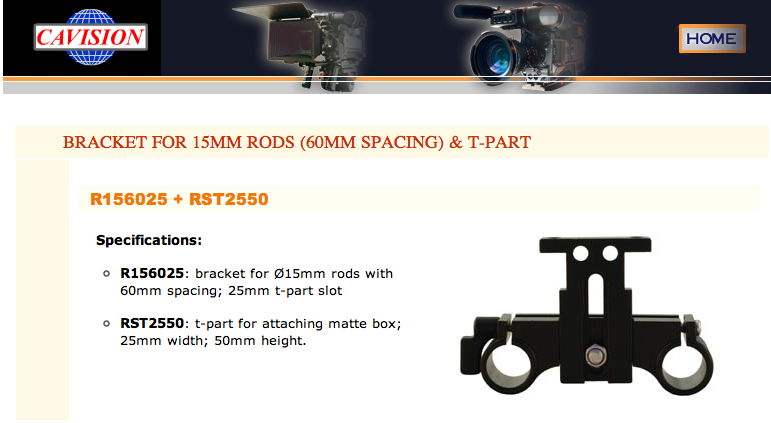 These are the accessories that I will purchase along with the Cavision Mattebox. Once again thanks for you input. One of the best video gear purchases that I have ever made. No donut necessary! @QuickHitRecord very interesting mattebox concept and that it works with the Cavision 3x3. Thanks for pointing it out. Thanks for the link that is pretty cool.... What is it sliding on (Ball Bearings)? and how long have you had this product? I have the first generation Tokina 28-70 2.6 as well as a Nikkor 80-200 2.8 that I use for video. Both of these zooms have internal focus/zoom rings. But some of my manual focus lenses do not so this would be really handy for these lenses. How did you mount it to the Cavision Mattebox? Was there any types of modifications that need to be done for this to work with the Cavision Mattebox? @Azo I have had this piece of gear for about a year. There are no ball bearings. I'm not sure what the secret recipe is for smooth sliding, but it slides very smoothly. The Y-shaped bracket that it comes with will not work with the Cavision mattebox, but you can buy a Cavision T-bracket that screws into the two holes at the bottom of the matte box, and then attaches with two screws through the channel in the T-bracket. It does not fit the groove as snugly as the included Y-bracket, but it works great. I also have the Tokina that you are talking about and I find that the additional point of contact provided by the mattebox attached in this way helps reduce shake even further when pulling focus. Also, it's very easy to lock in place so that it doesn't slide, and then to remove when you need to change lenses. @QuickHitRecord, do yo have the part number for the cavision T-bracket? I think I will try the slider base with mine. So you bought the slider base, SBYL and the cavision T-bracket that's it? Also how smooth is the sliding? Any noise that can be picked up by the mic? @Hilltop1 I don't have it with me to double check but I don't remember it making any noise. The t-bracket is the same one as above I believe (RST2550). I think that there is a longer length if you need to get your matte box up higher. There may be a shorter length too. I ordered the Cavision 3X3 matte box from B&H Photo. I would like to order the slider base but want to confirm that we have the same parts. On the Cavision website they have 2 versions of the bracket/t-part. 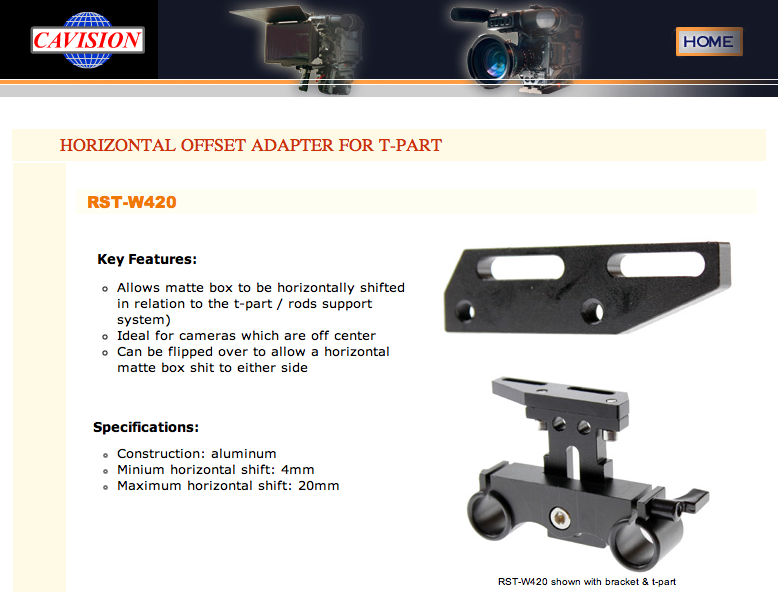 The bracket/t-part (R156025/RST-2560) that I ordered is the one with the 25mm option they also have a 20mm bracket/t-part. I just want to confirm that you have the same parts before I order the slider. @Azo My bracket actually came with an older model 4x4 Cavision matte box that I used to own, so I don't know the product number but I am pretty sure that we are talking about the same part. Mine is also 25mm wide, though theoretically both widths should fit within the groove on the sliding base (the 25mm is not completely snug, there is a little extra room but I just take care to lock it down with the two screws and it's fine). Ok, so now I need to order some ND/Polarizing filters. Would you mind telling me which brand of ND/Polarizing filters you recommend for this matte box. @Azo I did some research on this and the only filters that everyone seems to agree on completely are the Schneiders. They make 3x3s that cost less than the 4x4s. They are quite expensive, but I kept reading comments like "if you buy these, you'll only cry once." I bought ND 0.3, 0.6, 0.9, 1.2, and 0.6 grad plus circular polarizer filters, and a metal tray from Cavision to hold each of them (much better quality than the supplied plastic trays). I keep the filters in their trays, and they all fit nicely into a pouch designed for 4x4 filters. There are less expensive alternatives out there (Cavision has their own range), but people complain that there is a color cast or unwanted softness. Well, I guess I only need to cry once then :) Personally, I would rather spend the money up front one time and be done with it, rather then experiment with cheaper filters. I included a link with some pictures of the mattebox attached to Panny 14mm 2.5 to show what it looks like with this lens attached. This way you have a visual reference in terms of the overall size of the matte box and also how it works with the step rings attached. With out going into a whole bunch of detail all I can say is that for me this is the perfect setup for the GH2. Thanks again for sharing your experience and also the reasoning behind the purchase. You have saved me a lot of time in regard to research, trial and error, etc etc.